So we're here. Sweating and schvitzing, moist and perspiring. Yup, it's tropical. "Toto, I don't think we’re in Tibet anymore." And it's definitely not China. And how do we know? We came out of the organic moldiness of Nepal and the chaotic consumerism of Kathmandu to the warm hospitality of the Thai people. Bangkok is more like LA than Thailand, but even there, people were out-of-their-way helpful, and certainly not trying to rip us off at every turn. Well, maybe the tuk-tuk drivers- the three-wheeled motorcycle taxis that lurk at tourist haunts to overcharge their passengers for a thrilling ride through traffic. But most of the merchants asked a fair price and were willing to bargain. We spent six days there, in Bangkok, far longer than we wanted, because we had to wait for an available seat on the train north. We had a relaxing time at the Atlanta Hotel where we met several engaging women: two Swedes returning from Burma where one, a journalist, carried a hidden microphone for the Swedish Public Radio piece she was working on. A mother-daughter Canadian pair in the social work, behavioral medicine fields also became instant friends. Interestingly, 3 of the 4 of them were Jewish. I'd never met a Jewish Swede before. She said there were only 17,000 of them, but they made a lot of noise. She also interviewed me for another piece she was doing on health care. It was fascinating to her to hear about my visit to Bumrungrad Hospital where I underwent a comprehensive physical exam. Why would I make a special trip to Bangkok just to get a check-up? Simple. I'm an American. And since I'm on a leave from my job, I have no health insurance. But not to worry: we may have inadequate health coverage, but we have plenty of weapons of mass destruction. As relatively nice as Bangkok was with its clean, air conditioned rapid transit, and delicious 50 cent street food, it was nice to finally get out of the city. We threaded the bikes on foot through the congested, humid streets downtown to the main railway station for our overnighter north. The train differed from the Russian and Chinese trains I've traveled on- larger sleeping berth, no free food. We got out before Chiang Mai at Lampang, and headed north on a route that should have taken us to the elephant training camp. At least according to two maps. We started in the wide shoulder lane of Highway 1 before crossing over to the quiet, hilly and winding backroads. A pleasant ride, and 45 kilometers later, we were back in Lampang where we learned that the elephant camp had been moved, to near Chiang Mai, where our tickets were meant to take us in the first place. Highly reminiscent of leaving Kashgar, going in circles. But this time we had consulted the map. At least we had a beautiful tour and then some local men helped us to flag down a bus and reach the night's intended destination, Phayao. We stayed at the locals’ hotel for 4 dollars, en suite. An overhead fan was enough to keep moisture and mosquitoes at bay. 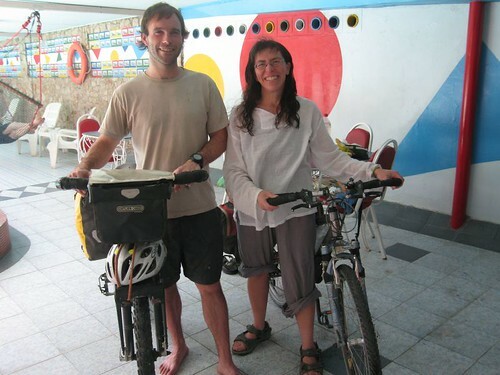 Next morning, we caught the bus to Chiang Rai where we started cycling in earnest. We rode the small roads for 82 kilometers, and were able to sleep in a small village bungalow. A shop girl pumping gas from her family's local barrels- atop 50 gallon drums sit three-liter, plastic graduated cylinders into which the fuel is hand pumped and out of which it is gravity fed into vehicular tanks- told us about the guest house. When she had difficulty drawing a map that we'd be able to follow, she said to wait a minute, disappeared, and then returned with a motor bike. She led the way back to our pleasant sleep for the night. The next day, 60 easy kilometers brought us to the border town of Chiang Khong where we could catch the slow boat to Pakbeng, Laos. We over-nighted in this tourist town complete with Mexican food and high-speed internet, in a multi-leveled, old fashioned house made of rich, dark, hardwood planks. It was lavishly furnished with traditional pieces, complete with hammocks and a fountain in the main lobby/guest lounge living room. Spacious, creaky, traditional, and with a large diameter tree growing right through the place- all for about six dollars. The next day, we shuttled to the other side of the river in a long-tailed, outboard motor boat to officially enter the Peoples’ Democratic Republic of Laos, and head downstream on a pleasant, five hour voyage. Loaded with about 120 backpacker tourists and a few locals, we motored downstream, even through some rapids, on a 70-foot long, six foot wide, wooden river boat. The 6-cylinder, diesel motor was attached to a hand-cooled transmission. A teenage boy was no doubt going deaf from his job which was to wet down the old, greasy bath towel which was wrapped around the gear box with water scooped from the bulge with a 1-liter plastic bottle lashed to a three foot long, bamboo pole. Indian food for dinner, banana pancakes for breakfast, and we were off. Along small roads, banana trees sported bright red flowers, harvested field stubble surrounded the thatched-roof, raised shade platforms scattered throughout the cultivated land. Dog-faced, doe-eared cows ate their fill from the lushness of Chiang Rai province. Back in the saddle again, I was brought back to the last days of Tibet, recalling when I was full of the sense that we were in the theatre but the play was over. The lights were on, but everyone was gone. The stage was empty. The place was cold and abandoned. Even the stones were frozen. In contrast, this was everything easy. People said our route would be hilly. But it seemed to be more down than up. And the wind, when it wasn't at our back, brought a gentle cooling to our untaxed cycling bodies. Coming down from the Tibetan Plateau last month, our first day was more up than down, and always struggling hard against the wind. "This isn't the movie we came to see," I told Chris. You know how you go into a multiplex and a few minutes into the film you realize that you are sitting in the wrong theater? "We're supposed to be seeing The Longest Downhill in the World. This is the wrong movie!" But no mistake in Thailand. It was merrily, merrily, the ride is but a dream. The road was smooth, with a wide enough shoulder. The drivers all seemed to know where they belonged, and stayed there. Chris noticed that we didn’t hear any horns. An occasional gentle toot was just for the wave, the thumbs up, the "good going". Clearly, we had entered another world. So, how do we know we are not in Tibet? Well the food here is delicious. The air is relatively clean. We are not coated with dust. Our noses aren't runny. There is litter, but no garbage. People have toilets and know how to use them so we don't have to watch where to step. The hotel beds don't have springs protruding and unmentionable dirt in the corners. Children don't try to grab the bikes as we pass. "People smile here," I said to Chris. It’s really amazing after going so long without. When they say hello and then laugh, it's because their mouths feel giddy from the foreign words, not because they are mocking us. 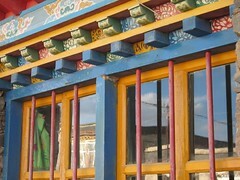 But the main way we know this isn't Tibet though, is how we are dressed: we are wearing sandals! Happy Halloween. The five French Canadians in the hotel are ready with costumes, but I might miss my favorite holiday since there are two competing interests this evening: having my first shower and shampoo in two weeks when the hot water comes on between 7 and 10 pm; or sleeping before cycling tomorrow morning to help me make it the 60 or more kilometers it might take to reach an indoor sleeping site. Because I didn't sleep much last night, crammed in the back row of a stinky short bus with four other travelers riding with 15 other Chinese citizens, most of whom smoked through the night, "resting" against the ice-encrusted window, trying to keep from freezing beneath a PRC army coat. But at least we arrived in one piece this morning, scraped the centimeter of dust off the bikes and settled into a fairly snazzy $15 hotel room with hot water for three hours each night. The past two weeks have been full of ups and downs. 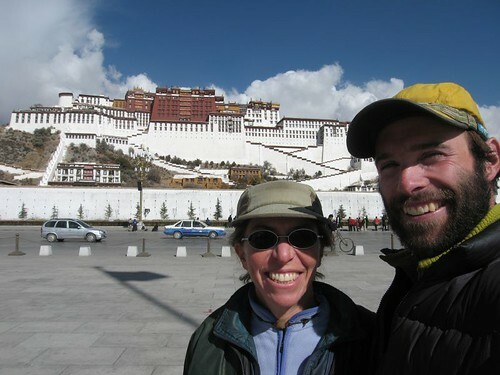 I wrote little more than a list of topics to cover, because for some reason, Tibet muzzles its pilgrims. So here are a few of the thoughts that reverberated through my troubled mind during the past fortnight. The thing you notice when you travel east in October on the Tibetan Plateau is My Left Foot. That's the one that perpetually rides in the shadow of the front panniers and never wants to warm up during the day. The right foot is quite comfortable, full sunshine penetrating the worn canvas of the the old summer hiking boots. In fact, the sun innudates all parts on the right side, as that is the direction of south. You can't really say that it all evens out- the right ear, the right cheek, withering and burning if you don't continually reapply sunscreen. 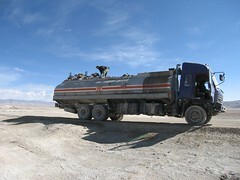 Part of the challenge of the road. If it's not the cold, it's the headwinds. If it's not the headwinds, it's the dust. If it's not the dust, it's the sand. If it's not the sand, it's the gravel. If it's not the gravel, it's the washboard. If it's not the washboard, it's the gradient. If it's not the gradient, it's the altitude. If it's not the altitude, it's the cold... That's on the road. In the tent. If it's not the smelly feet, it's the stinky gas. If it's not the gas, it's the B.O. If it's not the B.O. it's the garlic breath. If it's not the breath, it's the feet. Part of the acceptance of the trip. 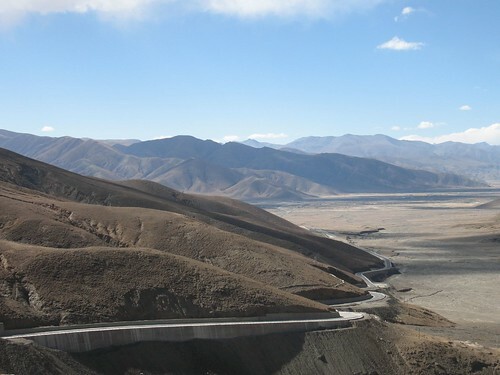 Dogs, Doo-Doo, Human Excrement and Garbage: This is Tibet? It has been hard to come to terms with what we see every day here. Disillusionment with some mythical anticipation of what Tibet would be. 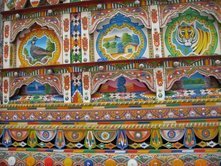 Prayers wheels, stupas, gompas, bells and colors on women's thick woolen garments, sweeping skyscapes. Yes, those things are to be seen. But more impressive, albeit in a very negative way, is the refuse everyhwere and the lack of concern of those who deposit it. I'd heard of the vicious dogs present in Tibet. Well, canines are abundant, especially around the ubiquitous garbage heaps that punctuate every village road and path, but even the feeblest three year old is adept at tossing stones which these pups abruptly heed. Even waving your arm or growling at them causes thes four-legged creatures to take their tails away with them. Of course their doo doo remains. But this is of little consequence. When walking in the open- and here it is mostly open- you quickly learn to train your eyes and plot your path carefully. Yak and sheep and the occasional goat turd is not the least bit of a nuisance, especially as it often warms your sleeping room in a sweet-smelling heat stove fire. So avoiding the dogs' waste is second nature. And when nature calls, they tend to move off to an untrod place. Not so, the humans. Inexplicably, the local poplulation finds it appropriate to stop and squat in any and every place. And if they do decide to use the constructed facilities, they leave their deposits anywhere near or about the intended hole, making it nearly impossible to find safe footing to correctly aim yourself. If you dare enter these public facilities. And so you likely also head out to anyplace you dare to do your business. Feeling more animal and criminal than human and wondering how people can be so casual and unashamed. That is the heading that Rich, the green card carrying Slovakian encaptioned a recent photo on his fantastic website (drogpatravel.blogspot.com) of several late season riders on the 219, as the Xinjiang-Tibet Highway is labeled, whom we first met him in Gilgit, Pakistan, at the end of our time there. In addition to Rich, nearing the end of his 6-month circa Himalya solo sojourn, is Nikolai the Dane who befell an unfortunate fate when he fell, alone before the crest of a 5160 meter pass and seriously injured his right hand. A sleepless, freezing and scary night sent him hitching to Ali where we met him for the first time, a few days later. He'd already heard of us from John, the kitchen-sink carrying Bostonian who combines hitching and cycling in a generous way. He makes Americano coffee and shares his oreos with good humor and kindness. He rolled into Ali on the bus which he'd flagged down en route, black-faced with diesel soot and cigarette smoke. And then there were the unstoppable French, Delphie and Ivan, who start riding at first light each day, and only stop for breakfast when the sun has climbed to a warming height in the sky- just about when Chris and I would be eating in the tent. 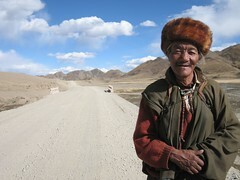 It was great camraderie to meet with others at the winter-end of the Tibet season. And for the past two weeks we have been leap-frogging and reconnecting as we ride at our different paces or sometimes hitch to the same places. 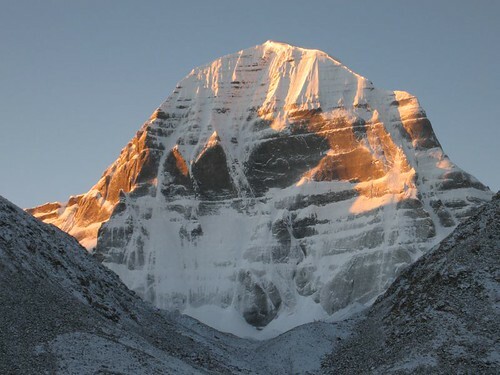 Clearly the high point, both literally (5660 meters) and figuratively, the walk around this holy and significant peak. 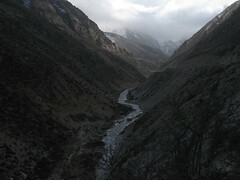 It is near the headwaters of four of Asia's most important rivers. And Tibetans believe that circling this massif brings blessings proportional to the number of circuits. For me, it was a beautiful a nd quiet time in the clear air, surrounded by colored flags which create prayers as they flutter in the wind. About 500 kilometers. 10 days riding or maybe 2 hitching. 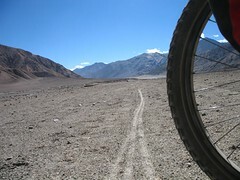 After our trek around Kailash, we decided we would just ride east for one day, because there was a village (read warm (? ), indoor beds with no need for tents or campstoves in the wind) just 42 kms. away. 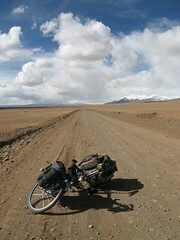 After that, we would hitch to Saga where villages would then be spaced just a day's ride apart. It's not that we don't like sleeping on our inflatable Thermarest mattresses and eating instant noodles three times a day. Well, maybe we don't love that stuff. But our tent zippers are failing and the stove is very tempermental and the winds are wicked cold and the scenery, while beautiful, varies only slowly. And more importantly, the very few villages we passed through were mostly run-down, small, and not the best place to meet new people or make local friends. Better get going and get to a more southern locale. So we set out for our one day of riding. 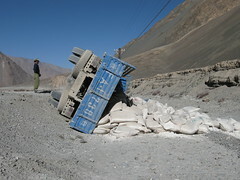 Less than a kilometer on the bumpy morning road, and a dump truck came by. 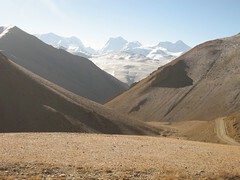 Chris made an instant decision and within an hour we bounced into Hor Chu, having collected the Dane on the way, who got about 8 kilometers out of Darchen. We spent the rest of the day hitching, which is how we realized it was very unlikely anyone would pick us up. That evening, at the Chinese restuarant which would be our home for the next 5 days (we slept in comfy beds in the "motel" in the back), our hosts told us a bus would come. It came the next day, going the wrong way, but we paid a deposit and waited til the day after tomorrow for it to get us. Well, it broke down somewhere on the way back, and it was only on the 5th day the we finally got to spend a jarring, freezing, sleepless night on the way to Saga. We are still searching for our purpose here in this country. Maybe the value of our time here isn't to collect astounding photos or make lifelong friends. Chris may have nailed it last night when he said that maybe the reason we are here isn't for us at all. Maybe it's for you. So that as your eyes and ears we can tell you what you see here- that this is not a country to fear. That the people are warm and friendly. They are kind towards us. They practice their religions diligently and take seriously hospitality to strangers. People were eager to meet us, and when they learned that we were Americans, they were accepting of us, patient to listen, and understanding of the fact that the citizens are not the government. The scenery is compelling. So it's hard to admit I am getting tired of terraced fields on the steep mountainsides with corn, wheat, potatoes and beans, forming tidy geometric patterns on the irrigated alluvial fans streaming wide at the mouths of deep canyons: twenty captivating shades of green leveled against the sandy, tan, grey and brown stones slopes that are the Hindu Kush, the Karakoram, the Himalaya. Farther north, the views are punctuated with the drama of crisp, peaks, all far higher than Mt. McKinley, soaring more than 4 miles up to pierce the sky. 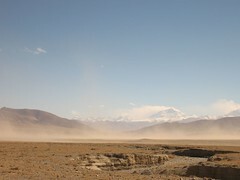 Down here,all is dusty, coated with the dryness four rainless months have brought. Only the glaciers still flow, feeding the fields through an ingenious system of high canals, bringing water from the frozen sky to the roots of every plant. It is beautiful. But I am jaded. There is only so much scenery to see. You adapt quickly, so what is jawdropping and rubber necking, soon becomes a familiar backdrop and you want more. But I think we bit off more than we could chew. We somehow sidestepped the careful planning that has gone into our trip, and set off with our bikes to cover about three weeks worth of touring in only eight days. We expected to hitch segments of the route- to save time, to pass more quickly through areas we were cautioned against, to avoid riding up the most rocky and steepest sections. But we didn't expect to be hit with such debilitating diarhrea that has taken its toll in forward progress, with time on the bench. So last night, in our flea and bedbug inhabited hotel in the very charming town of Chitral, we had a late planning session. It became clear that our options were three: rush on by vehicle to complete our intended loop through Dir, Swat,and Kohistan; delay our push-off to Tibet by a week, starting around September 20; or enjoy some time at the Kalash Valleys and then return by jeep the way we came. It seems as if the third will be our chosen alternative. Some of the sections I wouldn't want to repeat, such as where the road is winding and narrow and rocky, scratched right into the rock wall and hanging precariously over the edge of a deep gorge below. I especially don't like when other overloaded jeeps come at us and someone has to back up to allow room for two vehichles to pass. But the latter parts, getting closer to Gilgit, were so beautiful, they returned to my sleeping dreams. Picturesque villages along a bouncy, blue-green river. The essence of summer, with relaxing sandy river beaches and the king of roads with downhill, smooth pavement. If we have to go back, it won't be so bad. What Are We Doing in Pakistan? Here it is, 10 days into our time here, and I am feeling apprehension and dissatisfaction. 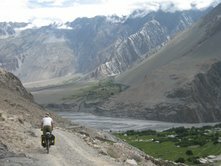 We are riding and hitching a great distance in a short time, making a loop through several of the Northern Areas: Ghizer, Chitral, Dir, Kohistan, Swat, but not having any real contact with locals; riding through emptier places than we expected; and being in much more of a hurry than any other time in these two months. Our purpose here is elusive. In Kygyzstan, clearly it was about experiencing the environment and everything in it- nomads, sheep, horses, yurts, flowers and the color green; enjoying activities: hiking, mountain biking, horsetrekking; and visiting friends and favorite places. 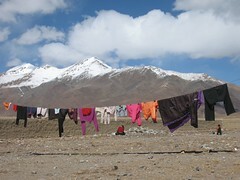 Tajikistan, for us, in contrast to the stony, barren and silent landscape, was about hospitality: tea, lunch, overnighting, weddings, hotsprings - people bringing us into their homes and lives. 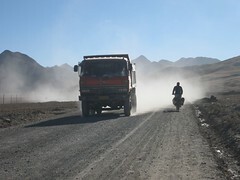 China was all about riding; transit through empty spaces, from Kyrgyzstan to Pakistan, from Pakistan beyond. And China was about good food. We like eating in the Peoples Republic. But what are we doing in Pakistan? I am sitting in the morning tent in Shandur Pass, site of the world's highest polo grounds, all but deserted in this early fall season, save the few soldiers in the barracks behind the small mounds to our east, and the yaks grazing nearby to the west. Chris is trying to cook our corn mush and date breakfast on the last of the bad Tajik fuel which we bought from a five gallon bucket in Murgab. I am typing away, trying to make sense of my time here in Pakistan. We entered the country with some difficulty. The Chinese bus we boarded in Kashgar, we expected to get off of at top of Kunjerab Pass to ride the 86 downhill kilometers to the border town of Sust. But the Chinese driver refused to let us out. He claimed that about a month ago he had let two other foreign cyclists off at the pass so they could ride down. When he arrived in Sust without them, he was made to go back and retrieve them. I doubted his story. When we arrived at Immigration, I lodged a complaint against him. He was brought in to the chief and told that he should have let us out. It helped that it was a misty, drizzly day with poor visibility and a slick, broken road. But it was already done. We had already arrived in a town of men. Only traders, hoteliers, cooks, shopkeepers, barbers and chicken-killers - there are fresh birds everywhere to be bought, feathered or plucked - were to be seen on the streets where we spent our first night in Pakistan. All dressed in the baggy pajama-style shalwar kamiz, which is local dress for men; Chitrali hats, wool caps with a rolled brim; and facial hair consisting at a minimum, of a moustache. I'm wondering. 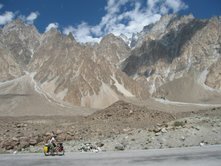 Originally the plan was to take two weeks riding on the Karakoram Highway (KKH), stopping off at the great places along the way in the Northern Areas, ending down in the the town of Gilgit, as I had done nine years before. We moved quickly, and had five great, scenery-filled days of high activity and elevated moods by the time we reached there. 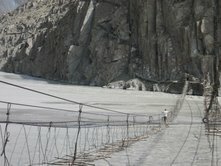 On the third day in country, Chris got the chance to cross one of the famous and freaky suspension bridges near Passu. I couldn't bring myself to do it again, and was content to play photographer. 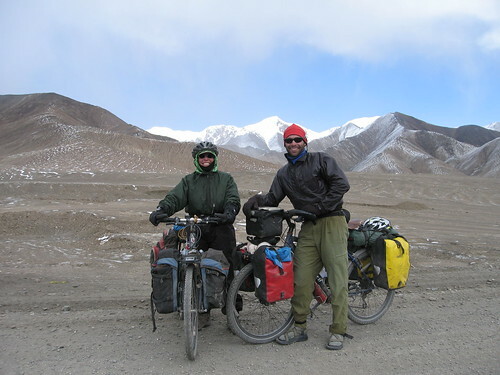 Early that evening we arrived in Karimabad, the tourist capital of Hunza, where we met Mercedes and Enrique, Spanish-speaking cyclists into their fifth month on the road. We relaxed there, did some tourist shopping, paid too much for dried apricots and would have paid too much for walnut cake and Hunza museli too, if the power hadn't been out for the past two days. 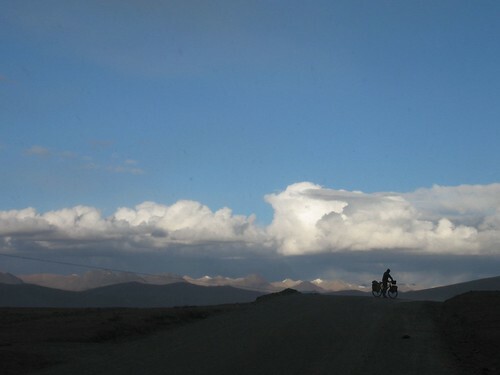 The next day, we had a late afternoon ride through winding village roads, through the frenetic strip of business that was AliAbad, to the pleasant village of Minapin. The hotel at the top of the hill hadn't changed much: the apple trees were thicker and there was a new high-end wing on the hotel. There was a new proprietor, although the previous one was around, and we remembered each other and the tea and chips (thick cut fries) were as good as ever. Only the welcome had changed. 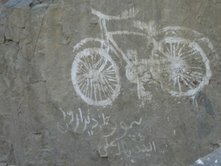 Four kilometers back, begining at the turnoff to the village, was a barrage of signs on walls, stones, buildings, bridges. Down With The USA. Kill Bush. Crush Israel. It seems recent events in Lebanon had provoked this outcry. This did not reflect our experience anywhere else, as we were often greeted by children giving us pears, teenagers grapes, men apricots, grandmothers apples, to welcome us to the country. Likewise, some group is responsible for painting other signs on stones: Love Nature, Educate Your Children. Peace is Wealth. Help the Tourist. 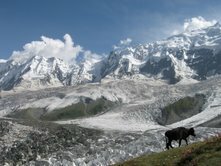 We had our best day so far, trekking 4000 feet to the Rakaposhi Base Camp. I had hiked to this 12,000 foot lookout before, but it had been snowing, so when I got to the viewpoint I saw only the sharp jagged teeth of the glacier below. This time, we emerged on the ridgetop in full afternoon sun to a rising wall of snow and ice full in our view. We giggled and laughed at the crisp blue sky and clean white faces rising another 12,000 feet above us to their 7740 meter heights.On the fifth day, we struggled in the heat and arrived in the hectic, crowded, trafficky city of Gilgit, just at the close of dusk, after 92 mostly smooth, uphill and downhill kilometers. The Madina Hotel was a welcome garden haven in the midst of the madness. The owner Yakoov, is a gentle, practicing Ismaili Muslim man. His ethics and demeanor were inspirational. An added joy was the reunion with Karim, a local man still affiliated with the hotel that I had kept in touch with sporadically since we first met in 1997. He was able to bring deep insight into the local culture and politics.So, five great days in Pakistan. And then what? Armed with Mercedes’ suggestions and trip notes, we decided to spend the next 10 days on this counter-clockwise loop, exploring some new and reportedly friendly regions in the North West Frontier Province. Two days into it, why am I so unhappy? 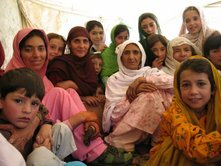 "I don't want to do this anymore," I cried, curled up on the the ground, sucking warmth from the dirt, hiding from the wind behind a big rock, hiding from the reality that I was somewhere in northern Pakistan and just wanted to be done with all this. 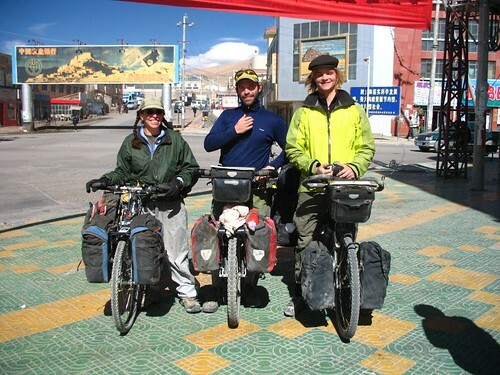 Sobbing, I was really wondering why I thought I could do this bike trip in the first place, and how I was going to get out of cycling across Tibet. "It's too hard. I have no energy. I'm too lazy. I can't do this." "It's OK to have a bad day," Chris soothed. "You can cry if it makes you feel better." Chris brought me a drink and the crumbly yellow pad to rest on. He was treating me so kindly, despite my ineptness, I felt even worse: weak, lazy and undeserving . 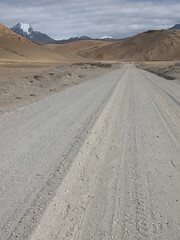 I had really wanted to make the 48 kilometers to the top of Shandur Pass. We'd only gone half the distance but I knew that I was finished. All I wanted to do was lay down with the last pages of the novel I'd finally cracked and read until sleeping at the early failure of light, now around 7pm. Just then a vehicle came by.It would have been one thing if I were really sick. Raging fever. Vomiting. Then I could easily justify getting off the bike and into a Landrover. Sure, my stomach was queasy and noisy and caused me little appetite resulting in poor nutrition and lack of fuel. Too, I had a bit of a tickle in my throat and too much mucus in my lungs. The dramatic drop in barometric pressure, replacing blazing sun with clouds and coolness, and maybe a bit of hormonal deficiency- I guess these things were all contibutors as well as maybe road fatigue. A bit of apprehension travelling to slightly questionable areas. Maybe a sense of disingenuousness at travelling so far and cycling so little. to my lassitude. But I couln't excuse myself for my poor performance. 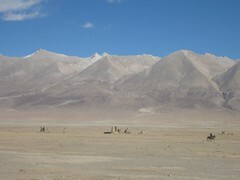 The driver took us to the top of the pass, site of the world's highest polo grounds. Mercedes raved about the place, saying you could spend days there just relaxing. We found it a bit bleak and uninviting even though there were tall mountains and it was very quiet. We later learned that early July is the green season when the place was crawling with national tourists. 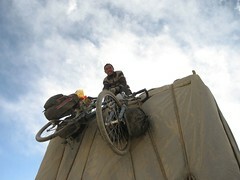 We got the tent up in the cold wind, and Chris prepared a macaroni soup with the last of our Kyrgyz dried tomatoes. We had mistakenly left most of our food in China when we set off for this brief Pakistani holiday, so we had very little of interest to eat. 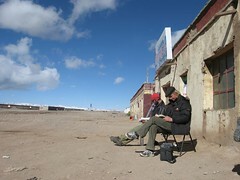 But we had arrived at our resting place for the night, Shandur Pass, where I retired early with The Life of Pi. Catastrophe averted, and we are on track again. 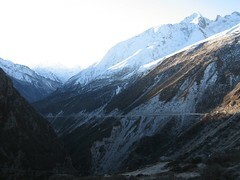 It was a delightful and rewarding descent from the top of the pass into the village of Laspur. Not for the first time I was glad that I have a mountain biking background, as it was actually a somewhat technical descent. 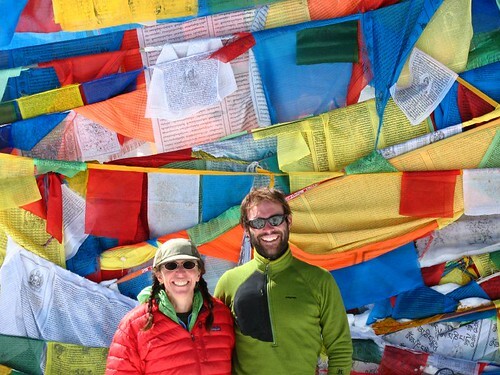 In fact, we met a medical French couple in the Kalash valley, several months into their two and a half year world bike tour, and Chloe remarked that it was a very difficult ride down for her. We thought it was great fun. Well, maybe Chris wasn't so thrilled after he realized that the thunk he'd heard was his water bottle flying out of its cage, and he had to run back uphill retrieve it.As we contined along the rock strewn, dusty road, there was a sudden reversal of fate as Chris sought rapid relief, at first behind the cover of large boulders, and eventually just anywhere off the bike. 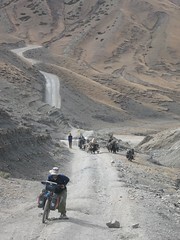 Our progress slowed as we neared the village of Mastuj, happy to rest early in the Merecdes recommended hotel. What she failed to indicate was the four kilometer climb to the village proper, up a steep, loose gravel bed, and up some steep, sandy sections. During the next 24 hours, Chris managed to find relief a total of 30 times. I guess that qualified as severe diarrhea, warranting a course of Ciproflaxcin. It also warranted an unscheduled layover, the bright side being that our hotel proprietor invited us to join him at a neighbor's son's wedding the next afternoon. It's hard to understand, but as in Tajikistan we were treated as special guests. Festivities were already underway when we arrived to the big tent in the neighbors' yard. We were ushered across the central clearing, stepping through the ring of men and boys, five deep on the perimeter, and given three of the very scarce chairs to sit on, which were vacated by less worthy souls. In the center, in turn, small boys and then grown men danced- solo, or just a few at a time, while the males forming the ring clapped to the rhythms of the paid musicians. Where, you may ask, were the women ? Well, some of the girls were peering over the back of the courtyard wall, close to the home where they were relegated. But for the most part, all the females were crowded into the house and courtyard, away from the men, away from the music, away from the central celebration. We witnessed this because when they saw our cameras, the hosts asked us to come to the house and photgraph the bride and groom. I was glad to be able to interact with the grandmas and the girls. But I was baffled at the men's idea of a good time. At least in Tajikistan, the men got to dance with the women, and the women got to show off their finest for the men. This day was the beginning of dismay for me at the intensely patriarchal society that prevails in much of the area we visited. Our stay at the wedding was relatively brief, as the dancing ended and heaping plates of pilu (rice pilaf with mutton and carrot) were served. They specially placed us at a table with chairs, and even brought us spoons, as food is traditionally eaten with washed hands. Just as fast as they were fed, everyone filed out or the yard, to return in the evening for the real party. We opted for a decent night's sleep so we could be on our way in the morning. By jeep. The next day we were in Chitral. By the time we had been to the Kalash and back, we were ready to head back to Gilgit. 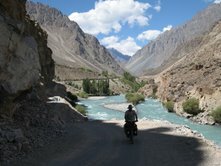 It was joyous to cycle again along the Ghizer River. Gemstone aquamarine blue green water under the cacaphonously clashing azure heavens. Armies of school girls bouncing home in their sky blue or turquoise green shawls, separate from the troops of boys in their gay blue, button down collar shirts. "How are you? We are fine. What is your name?" Shy giggles and smiles and a bold girl daring to speak English out loud to the foreigners. The same in every village. The same passing each of the many schools. 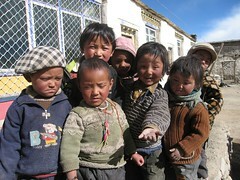 If you've heard of them, you know thatthey are some Other People living in a remote valley in northwestern Paskistan. The women wear black cotton dresses, heavily embroidered at the shoulders and hem, and tied with a broad, bright, handwoven belts of hot pink or bright orange color. Their necks are draped with 50 or more strands of yellow and orange bead strings. A top their heads are a too-small beaded crown with varieties of metals bells, plastic buttons and white seashells added to make intricate patterns with strong, bright beads. An 8-inch wide tail trails down from the center of this crown, three more pounds of trinkets beaded into a continuation of the headband. These head pieces are balanced on theskull, resulting in excellent posture among these girls and women. They are trained to wear them beginning around the age of three. Their bangs are long and combed forward, and then braided into three different width plaits right at the front crown. These long tails are then turned and pulled back behind the head to trail below their headdresses. The rest of their hair is cut very short. Begining at seven years old, girls get their first tattoos- simple stars, circles, crosses and dots - on the forehead, the left cheek, the chin, the right. They marry young and live with their families in slate and log houses- rectangular, dark, and seemingly suspended among the cliffs. They are farmers, growing grain and beans and vegetables. The are arborists with walnut, pear,apple and other stone fruit fruits. And they are enologists, making wine. An enclave in a Muslim land, they have their own culture and society. They are friendly and welcoming to strangers. And in the warm months they receive many. Not only foreign tourists make the journey out to this distant valley, but local Pakistani tourists come out, especially young Muslim men. For where else can they drink their fill freely of wine when they live in the dry province of the Northwest Frontier? We got a ride back to Chitral town with one such carload of 2nd year engineering students from a village four hours away. One seemed comatose in the front, another riddled with head pains in the back. They insisted the driver was sober, but an hour into the ride I was eager to change vehicles, so when the students stopped for a short break, I flagged down another car and we quickly piled in to a gasoline fume saturated jalopy. Out of the frying pan and into the fire. 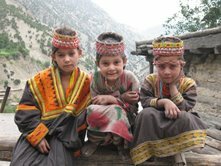 We had had an overnight stay in the valley of the Kalash. Not enough time to get to know the people or their animist religion, but enough time to take pictures, teach a girl to juggle, and teach an 8th grade class about my home state and its animals. After the vocabulary-geography-art lesson was over and we opened it up for questions, there was just one. A confident boy in the back asked, Why is America so harsh towards Muslims?"